Large capacity duffel bag that provides general purpose soft luggage use. 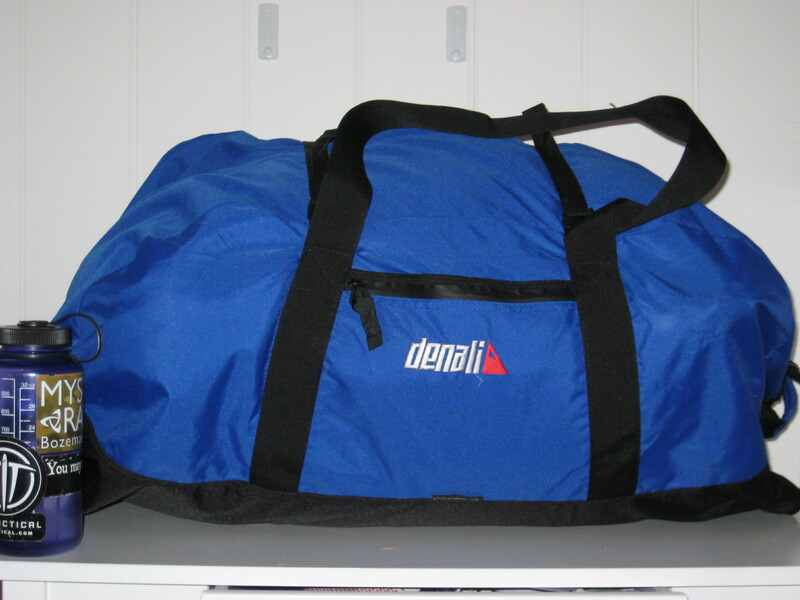 The Denali duffel has been bought with my own funds. Duffel bags don’t need a great deal of explanation. They’re effectively a very large, simple “tunnel” or sausage-like cylinder of material, with a zip running down the top surface for ease of access. The Denali main body is a two tone material. The upper surface is blue, and the lower surface is black – better able to hide scuffing and dirt, which is a nice touch, showing attention to detail. The pull tabs also have large loops allowing them to be padlocked for security during travel, as an anti-tamper or tamper-evident measure. The main zip has double pull tabs, with a fabric pull loop on each tab. At each end of the zip is plastic hardware to allow a shoulder strap to be clipped on. At each end of the main body is slightly padded handle, to allow ease of handling during use, such slinging the duffel onto airport luggage check-in belts. On one side of the main body, is a small zip accessed sundries pocket. Interestingly for Denali, is the use of webbing straps and Fastex buckles to act as load compression straps. These also aid in relieving tension on the main zip when fully loaded, and from handling stresses during the journey, such as that found inflicted by baggage handlers at any airport. As befits such a simple item as a duffel bag, there is no internal organisation. All internal seams are however, taped. Nice attention to detail. Duffel bags are one of those luggage items that I find really useful for just throwing in stuff willy-nilly and not having to worry about too much. This particular duffel bag was originally acquired as a “pack-bag” by my wife to stow her hiking pack into during domestic flights on our trip to Tasmania to walk The Overland Track (see trip report HERE). As a pack bag, it has worked really well to prevent damage to her Mystery Ranch Wolf Alpha, and help us blend in with the madding crowd, by having a low profile collection of luggage that doesn’t scream “tactical” at travel hubs and large groups of people. I’ve liked using duffel’s for those trips when not much walking is going to be involved, or luggage may need to be shoved into different shaped spaces. They’re hardly ever filled to capacity under these circumstances. Generally, I like them for when I used to drive over 500 kilometers to work. Under those circumstances, the duffel with a week’s worth of work clothes, toiletries, PT gear and other miscellaneous small items would be thrown onto the backseat or tray of my vehicle for the long drive to start the working week. Quite a well made, simple and rugged duffle bag. There’s not much to complain about such a simple item. My only real complaint is the shoulder strap, I find them absolutely useless on such a piece of equipment. Thankfully, it can be easily removed if not needed. There’s a lot to like about this simple duffle. They run cheap enough that one won’t cry too much should they wear out and give up the ghost. Posted in Civilian, Long Range, Miscellaneous Equipment by 22F with no comments yet.